The Sound BlasterX H5 headphones were provided by Sound Blaster for review purposes. Ah, sound. Hearing is such a wonderful sense. Many underestimate it, but I love it, so when it comes to reviewing headsets, headphones, earphones etc. I’m a happy guy. I’ve always liked decent earphones/headphones for music, but only really got what I’d consider to be a “gaming headset” for the first time about a year or so ago. I use it a reasonable amount for the things you’d expect, Teamspeak, Discord, some atmospheric gaming etc. The main difficulty I always find with it is comfort after an extended period, not so much that it was overbearingly uncomfortable, but at the same time it was noticeable that I was wearing it, so this will be one of the key things we’ll look at as I think it’s an important aspect of any headset, gaming or otherwise. 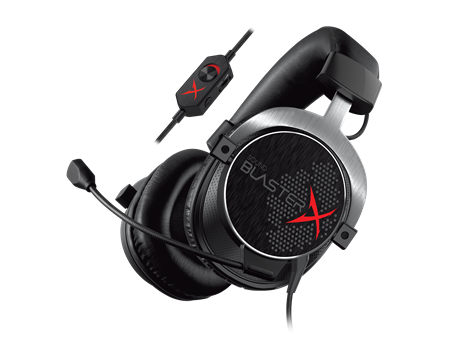 Today we’re looking in particular at the Sound BlasterX H5 headset. It’s the mid-tier around the ear offering from the long-time PC audio specialists (Creative Labs who make Sound Blaster equipment) having larger drivers than the entry level H3’s (50mm vs. 40mm) and lacking the 7.1 surround and USB connection of the H7’s.